Obsolete equipment has become a major concern for the nuclear power sector. Andy Foreman explains how assessment and replacement of pumps with dimensionally and hydraulically interchangeable designs can reduce costs and disruption to operating plant. THE NUCLEAR POWER INDUSTRY ACROSS Europe has been using a multitude of end-suction centrifugal pumps for a variety of duties, including oily waste water, screen wash (filtering and cleaning sea water), cooling water and condensate transfer. These pumps have a 20 to 30-year natural replacement cycle and in many cases are coming to their end of life. They must be replaced or undergo full refurbishment. Original equipment pump vendors included manufacturers such as Girdlestone, Pullen, Godwin and Goodwin, but in most cases these vendors are no longer in business. Like-for-like replacement is not possible and it is hard to refurbish and source spares. The replacement pump will probably have different dimensions, baseplate mounting and connections. To install it the operator incurs additional downtime and expense, needed to replace pipework, fittings and mountings etc. This can far outweigh the cost of the new pump. A replacement pump must perform to the same hydraulic specification as the original. This may be straightforward if the original pump specification is still available and a pump can be matched from a new manufacturer. But after such a long time the initial requirements and specification data may be incomplete or missing, so selection is difficult. For more demanding duties (such as low net positive suction head (NPSH) requirements where the pump is performing at the edge of its operating envelope) the detailed specification and design of the pump is critical to safety and reliable operation. Simply selecting a replacement from standard published curves may mean the new pump does not deliver the same performance as the original, raising cost and reducing reliability. This leaves nuclear power plant operators in a difficult position. 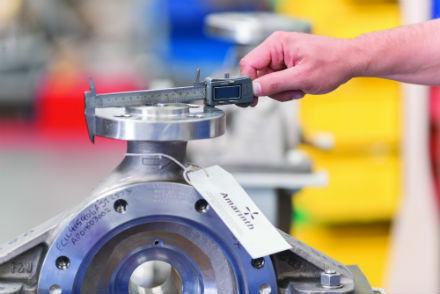 Off-the-shelf pumps require expensive modifications to pipework and fittings – which still may not meet the required hydraulic duty satisfactorily. Few major pump manufacturers are interested in supplying bespoke end-suction centrifugal pumps to replace the originals, due to the design work involved for what is a relatively inexpensive product and which for nuclear power stations must be certified as compliant with ASME BPVC Section III ND-3000 (adding further time and expense). In reverse engineering, the aim is to replicate a pump or component in dimension and material. However, this copies not only the pump or component, but also any inherent weaknesses. In some cases, original designs three decades old had poor tolerances, inferior materials, quality of manufacture or dimensional fit – most of which would remain, if simply reverse-engineered. With powerful computer aided technologies, the tools are now available to cost-effectively redesign components that can improve on those from original equipment manufacturers (OEMs). Three-dimensional modelling allows components to be designed and assembled digitally. Clash detection and tolerance modelling shows where problems may occur. Sophisticated computational fluid dynamics packages help engineers understand the flow of fluid through and around components, allowing a component that was designed many years ago to be analysed and then re-engineered to deliver an improved performance. Finite-element analysis software can read three-dimensional models and then stress the components, test different materials, pinpoint fracture points and perform fatigue analysis. Rapid prototype technologies can produce components at full size, directly from the three-dimensional models, in a matter of minutes, allowing engineers to examine the components before any expensive tooling is committed. The result is re-engineered pumps and components that can outperform and outlast the originals. British pump manufacturer, Amarinth, has used these technologies to develop a core range of replacement pumps. The company’s agile processes and procedures enable it to assess an existing obsolete pump, deliver a solution that is dimensionally and hydraulically interchangeable, and may also increase the performance or reliability of the pump it is replacing. For example, the impeller could be re-engineered for optimum performance for the specific duty – which might include enhanced efficiency, better stability and lower NPSH. All of this can be carried out within the dimensionally interchangeable body without any need to modify or replace pipework, mountings or any other ancillary equipment. To deliver the most cost-effective solution, a full mechanical and hydraulic assessment of the original pump is first undertaken. If the pump can be refurbished, then a full strip and service is offered where all critical components are replaced with new re-engineered ones. The pump is then tested and certified using the same procedures as a new pump, ensuring a further 20 years of working life or more. If the pump is beyond refurbishment, Amarinth will work with the operator to specify a bespoke interchangeable pump. It will identify and resolve hydraulic or mechanical weaknesses while ensuring dimensional interchangeability and testing and certifying it to the appropriate standard (including ASME BPVC Section III ND-3000). Pumps can be supplied with self-priming units and a range of condensate recovery units, which incorporate high-efficiency pumps with multi-stage motors and intelligent control systems. Skid packages comprising pumps and all ancillary equipment, pipework and instrumentation can be configured. Whether the pump is refurbished or new, the operator is assured of a full range of spares for the life of the pump. To assist in the identification of replacement equipment for the nuclear power industry, Rolls-Royce developed a proactive obsolescence management system (POMS) to provide quick and easy retrieval of equipment and vendor obsolescence information. POMS assists operators with power station obsolescence issues, collecting data from over 160 nuclear units worldwide and contacting over 20,000 manufacturers each year to determine obsolescence challenges and potential solutions. Power stations operators can refer to POMS when replacing obsolete equipment. However, centrifugal pumps has been an area of POMS that was not well populated and Rolls-Royce has found it difficult to get manufacturers to help. Amarinth worked directly with Rolls-Royce and POMS to identify the obsolete end suction centrifugal pumps currently in use and populated POMS with interchangeable pump and component references for all Girdlestone pumps. The company is currently working on populating POMS with replacement references for other obsolete OEM pump products. This will ensure that any operator around the world with access to POMS can immediately identify an interchangeable centrifugal pump or component when a replacement is required for an obsolete pump.